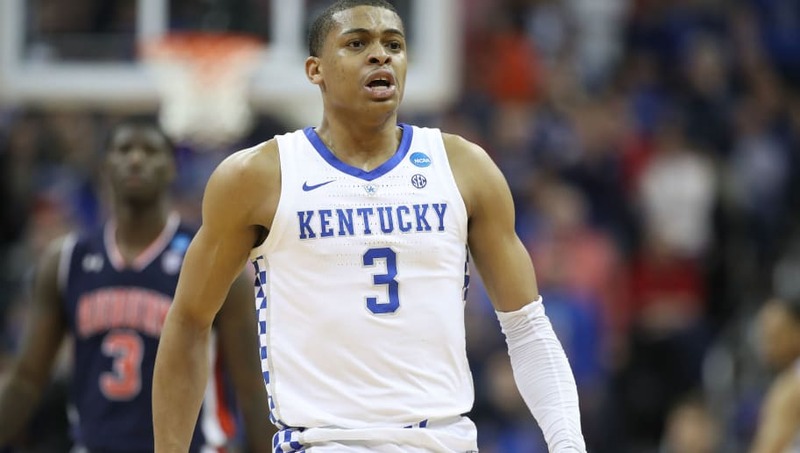 Kentucky Wildcats small forward Keldon Johnson is planning on testing the waters this spring in regards to his basketball future and the NBA Draft. While Johnson's decision to enter the draft is surely big news, the program may have let some details slip regarding the future of another star freshman. "Like Tyler (Herro) is doing, I fully support his decision to go through this process and get all the information." Tyler Herro, it seems, is also considering making the leap to the NBA, and based on Calipari's comments, Herro may be the next Wildcats star to declare for the draft. Johnson was named SEC Freshman of the Year this season, after coming out of Oak Hill Academy as a five-star recruit. He averaged 13.5 points per game and just under six rebounds during the 2018-19 season. Herro, on the other hand, averaged 14.0 points, 4.5 rebounds and shot the three at a 35.5% clip. Both players will evaluate their value in the upcoming draft. Due to new rules surrounding basketball student-athletes and the draft, players can return to school after declaring for the draft and signing with an agent, if they feel that is the best decision in regards to their basketball careers, by May 29. That seems to be the process which Johnson will explore, and possibly Herro as well. The two Wildcats stars seem set to ​join PJ Washington who also declared for the draft earlier in the week. Kentucky's Keldon Johnson says he will test the NBA Draft waters, but will return to school if he determines he will not be a lottery pick. The rule change is a contrast to a year ago, when players could declare for the draft but not hire an agent, unless they committed to leaving their university. Before then, players could not declare at all for the draft if they planned on returning to school. The NBA Lottery this year promises to be one of the most anticipated in years, with Zion Williamson's potential future team to be determined.